About 35 years ago, 175 cc trail bikes were so popular that all four Japanese manufacturers made them. These were not just street bikes that enabled you to cross a gravel driveway without mishap, but were on- and off-road bikes with bash plates and knobby tires, meant to be taken out to the back-40 and driven into trees and duck ponds. Although they were weakly suspended, underpowered, and undependably braked, the 175s by Honda, Kawasaki, Suzuki, and Yamaha were sturdy enough that today, our Man + Machine entry still rides his, and would like to find a bracket that would hold an axe, because the terrain he rides in often needs to be chopped up a bit. Norm Miller’s 1977 Suzuki TS185 was, obviously, not a 175, but in the June 1976 issue of Cycle Canada it was included in a four-bike test with the other three Japanese bikes, all true 175s. The boys took their little enduros into some rugged country and thoroughly harassed them, coming back later with charts and bruises and broken and missing motorcycle parts. Here’s part of what they said about the Suzuki: “Despite its sprightly performance (third overall) the Suzuki lost marks primarily in the areas of comfort and reliability. In fact, it was the only bike to lose the maximum of 200 points.” In fact, it lost 225 points on its Reliability Score, coming in 25 points below zero. By this measure, you’d have improved it by setting it on fire. 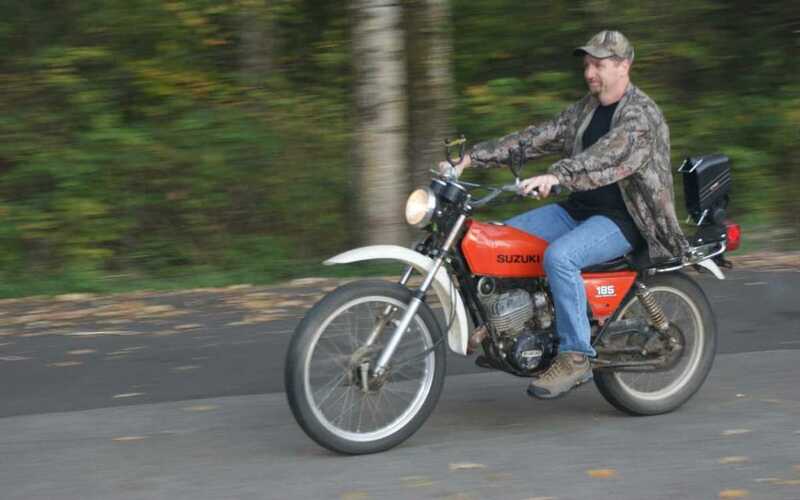 Miller, a 48-year-old truck dispatcher from Aldergrove, British Columbia, picked up his used Suzuki 185 in 1977 with a couple of hundred kilometres on it. He was 14, and he was thrilled to get his own motorcycle, which he rode around his family’s Fort Langley, B.C., beef farm. 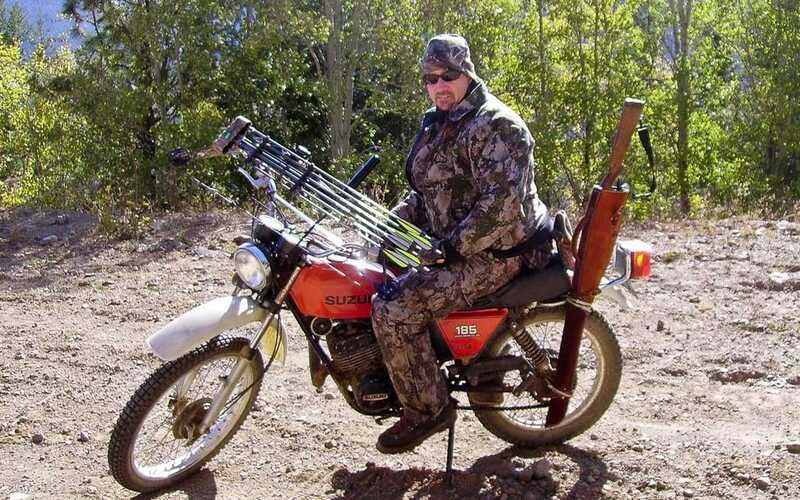 Now, he rides it when he’s bow-hunting for deer near Princeton, B.C., a pastime that he shares with his brother. He’s adapted a sort of handlebar quiver to hold the arrows, and he’s mounted a scabbard on the back for a shotgun. Hunting on the bike might be something you could do on the plains of Africa, but not in Canada (and certainly not with a bow and arrow), so the Suzuki serves to get him into places, and then to help remove game that he’s killed. What have you modified on the bike? I modified a rifle clamp for it to hold my bow, on the handlebar. The only other thing this year is a new scabbard on the back as opposed to a leather one that I had. I carry a shotgun with slugs in it because if you come across Yogi or Snaggletooth while you’re hunting, you’re not going to try to shoot him with an arrow. A defender basically is what it’s for. Besides that, I took off the signal lights, because for the riding I do, I don’t need them, and I removed the battery. You didn’t kill Yogi, did you? No. I’ve seen traces of no cougars, but bears a couple of times. But thankfully I have not had to use the shotgun. Do you carry game on the passenger seat? No, but I have dragged things behind it. I have a rope, so I wrap it around where the taillight is, and away you go. I hunt deer, and it can pretty much overpower the bike, so sometimes it has be cut up and quartered, and dragged out in pieces. Speaking of hauled out in pieces, you managed to fall off a time or two in your youth. Yes. The biggest one I remember is, because we had a beef farm, we used to have sawdust that we put in barns for the cattle, so I made my track on the sawdust pile. And I went over a big jump, and there was a bit of a berm so I ended up going head-over-heels over the handlebars. About three feet in the air and come down too hard and over I went. Didn’t break anything but got pretty banged up. The suspension is okay, but it’s a little light in horsepower. When you’re packing an animal that’s fully dressed, 400 pounds, I’m about 185 myself and then you throw another 50 or 75 pounds worth of gear on it, it has a little bit of trouble pulling a deer. A couple of hills I had to go up I had issues on. Last year there was a little bit of gravel and the feet were off the pegs, pedalling on my way up because it just didn’t have enough oomph. I don’t know if the clutch was slipping or just the nature of where I was, because it was pretty hairy. Is there anything you’d like to do to it now? I’m trying to find a bracket, something that would let me carry an axe. Some of the areas that I get into get a little tight. There are deadfalls; I’ve ridden over a lot of them but some of them are just too big to get over or around, and so I’d like to carry an ax. Yeah. I’ll probably keep her until she dies. She’s been a good bike for me.